THE Canadian Armed Forces Women in Force Program (CAF WFP) has wrapped up its inaugural 10-day events, which gave participants an opportunity to learn about military life before making a decision to join. The events were held simultaneously at CFB Borden, Ontario, and Saint-Jean Garrison, Quebec, from August 14 to 23. The 34 participants were able to experience different facets of a military lifestyle, including fitness training, hands-on demonstrations of occupations, and tactical skills, as well as the opportunity to meet and talk with women CAF members. The primary goal of this initiative is to inform and educate women on military careers, lifestyle, and the challenges and opportunities of CAF employment through a realistic job preview. By raising awareness about life in the CAF, the program aims to enable participants to make an informed decision about a career in the military. “These 10 days provided the participants with valuable information and experience that will enable them to make an informed decision about pursuing a career with the CAF. 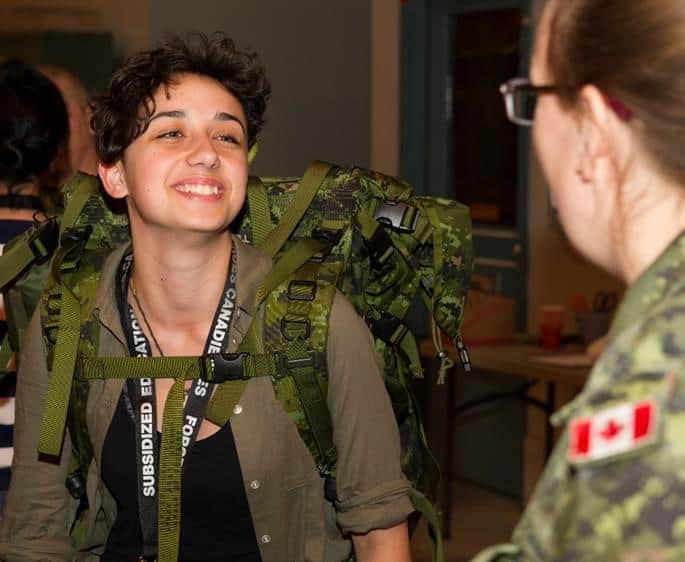 Regardless of whether these participants have decided to join the CAF, I am confident that they are now better informed about what life is really like for women in the Forces,” said Lieutenant-General Charles Lamarre, Commander, Military Personnel Command. “It was privilege to meet and speak with the women who are participating in this program. They wanted to experience military life and in so doing learn about the opportunities and benefits of a career in the CAF. I think the Women in Force Program has provided them an excellent preview. This program is just one of many initiatives that we are using to increase the recruitment of women in the CAF,” said Brigadier-General Virginia Tattersall, Deputy Commander, Military Personnel Generation. Harjit S. Sajjan, Minister of National Defence, addressed the participants at the Canadian Forces Leadership and Recruit School on August 17. He was accompanied by Jean Rioux, Parliamentary Secretary to the Minister of National Defence, and Sherry Romanado, Parliamentary Secretary to the Minister of Veterans Affairs and Associate Minister of National Defence. The CAF WFP supports a commitment outlined in Canada’s new defence policy – Strong, Secure, Engaged – that seeks to capitalize on the unique talents and skill sets of the country’s varied population by focusing on diversity and gender equality. Women currently account for 15.2 per cent of the CAF’s personnel (Regular and Primary Reserve Force as of May 19, 2017). In accordance with Canada’s Employment Equity Act and direction from the Chief of the Defence Staff, the CAF is committed to increasing the number of service women to form at least 25.1 per cent of its total personnel strength by 2026. The three-day pilot serials will be conducted October 20-22 at CFB Borden, Ontario, in English and October 28-30 at Saint-Jean Garrison, Quebec, in French.